Movie is narrated by Mahavir’s nephew and the girls cousin – Omkar’s point of view, which offers quite a few humourous nuggets which otherwise would have been quite boring. Mahavir Singh Phogat, a former national wrestling champion, wants sons to further his legacy and do what he never could, to win wrestling gold medal for the country on an International level but — despite all the ‘unfailing’ plans thrust his way by village know-it-alls — much to his disappointment he keeps on producing daughters. He gives up his dream of wrestling until a day when he realises girls can win gold too. This epiphany drives him into a fascistic crazy tiger-dad, pushing his daughters to breaking point where he doesn’t stop to take any distractions away whether it even be to mercilessly chop off his daughters’ hair and exposing them to further humiliation. Rightly said by him, that he can either be a coach or a father. As a biopic, though one-dimensional, the film is well-packaged and presented in a realistic manner managing the entertainment quotient.The plot keeps you engrossed right till the end and the climax, with the slow-motion shot of Geeta toppling her opponent, is exhilarating and overwhelming. What keeps you glued to the screen, from the beginning, is Aamir Khan’s transformation into a Haryanvi. Wow! The perfectionist doesn’t reinvent himself to look good but to look old, fat & haggard. This time, playing an aging wrestler, with added pounds and flab to his otherwise chiselled frame, he mesmerises you. He literally breathes and lives the life of Mahavir Singh Phogat in rural Haryana. This will be counted as one of his best performances. Can’t say this is the best as that will demean the characters earlier portrayed by him in lagaan & 3 idiots. It takes out the spotlight from those movies. Big shout goes out to Zara Wasim and Suhani Bhatnagar too as the young Geeta and Babita. They are simply adorable and charming. They portray their innocent and aggressive attitude with such finesse that you instantly fall in love with their characters and root for them. They lay the foundation for Fatima Sana Shaikh and Sanya Malhotra who play the older versions of the characters in the 2nd half of the movie. Similarly Ritwik Sahore as the young Omkar, lays the foundation for Aparshakti Khurana in the older role. They both do full justice to the character ( though my favourite is the younger one) He’s adorable with an amazing sense of humor blended with innocence. Cute! Vivan Bhatena in a cameo as Mahavir’s office colleague is wasted. Don’t know what was he there for. Sakshi Tanwar in a passive timid role as Daya, Mahavir’s wife, is unimpressive as she doesn’t have much say in Mahavir’s dominant ways. The songs and background score mesh seamlessly with the narrative. On the production front, the international games are realistically recreated with precision and overall the film has a very realistic look and feel. 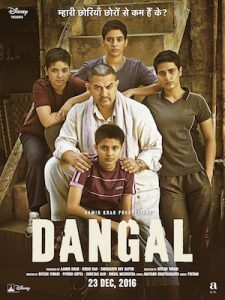 This movie strongly leaves a message for every girl & for every father. A beautiful unspoken relationship between a father & daughter. Watch it!